HCT Americas Summer Playoffs are starting this weekend. Let’s have a look at what players are going in as the favorites to win! A special thanks to @Shodda23 and @Old_GuardianHS for the stats and graphs which I used while writing this article! Some of the most common decks brought by the players are Spiteful Druid, Even Paladin, and Cubelock. Which comes to no surprise looking at the decks that performed well at HCT Europe just last weekend. Nearly every player attending the playoffs is bringing at least one of the most common decks with a some bringing two or more as well. Looking back at the Europe playoffs, much has changed with the further developing tournament scene. At the time a lot was still very unknown in the Witchwood expansion. The most notable is how few control warlock and mind blast priests are brought this time compared to last. Both decks performed very well overall so it is an unexpected change. You can see a graph of the changes here. Whereas the reduced amount of taunt druid comes as no surprise. The deck has a weak matchup against Even Paladin and Spiteful Druid. It only had a few great matchups against decks like the Mind Blast Priest and super aggressive decks as Hunter and Baku Rogue. Both weren’t played to great success last weekend. To prep for writing this article, I spoke with some of the European players from HCT Europe. I asked what they would bring now that they know the field. Most commonly their answer was a form of Warlock/Priest/Paladin/Druid. Those classes have the strongest archetypes and fewer weaknesses in swiss compared to lineups with Quest Rogue. Before the decklists were made public many wanted to target Quest rogue with the more control oriented meta that was expected after the Europe playoffs, but that wasn’t a risk many players were willing to take. 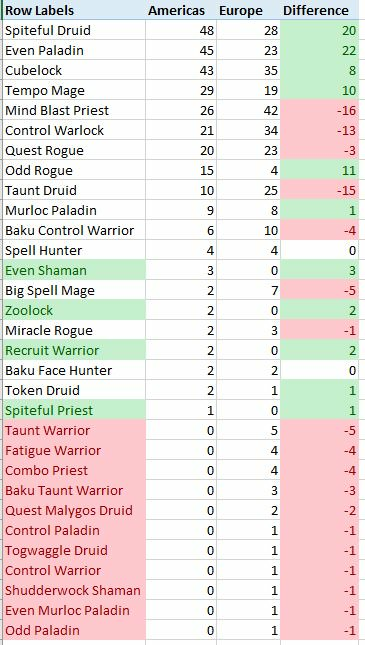 Looking at the stats provided by Vicious Syndicate; based on ladder stats, the dream lineup against the field would be Even Paladin with one of two well-performing lists. The first would be the Val’anyr list that is very popular right now; or the list with Dinosize and Lich King instead which is performing very well on the ladder according to HSReplays’ stats. Next up due to its overall strength against the field, Spiteful Druid with the full taunt package in two Crypt Lords, Tar Creeper, Saronite Chain Gangs and a copy of Druid of the Claw to be well off against the high amount of board oriented decks as Paladin and Odd Rogue. This is the most commonly brought Druid list though some other tech cards are different for some players. Brewer and two copies of Plated Beetle as alternative forms of healing after the Skulking Geist; played by most players, comes out and removes Dark Pact from the Warlocks deck. The final deck most agreed upon would be the Control Warlock deck with two copies of the aforementioned Shroom Brewer to be better off against both Mind blast Priest and the tempo Mages at the tournament. The power level of control Warlock is not to be underestimated which I feel many people did do for a format where you can ban its worst matchup in quest rogue. That brings us to who will do best this weekend? My money would be on a player called Klei#11805 with 47 HCT Points purely of their ladder play so far this year. They achieved this in January and February by finishing Rank 1 legend in January and Top 25 legend in February with another top 50 finish in March being 3rd place in the point standings overall in America. Their lineup is literally the dream lineup and they and Korextron are the only ones to bring this lineup to the playoffs this weekend. Korextron is bringing a different build of Even Paladin, though I like that one less due to its use of Drygulch Jailor and Lightfused Stegodon in the list. They have even more weaknesses to the bad matchups in Control Warlock and Mind blast Priest. Combined with Klei’s ladder record and great lineup prediction I think they’ll have a great chance at succeeding to qualify this weekend! The other player I want to mention is Fr0zen, though this may seem obvious as he got second place in the World Championships not too long ago. He brought some very unique decks I would love to see work out! I personally have never seen someone play recruit Warrior before. The Warrior himself, Fibonacci, has brought the same Warrior list. Looking at past Warrior creations of his, this may just work out. Fibonacci has the same lineup as Fr0zen, but has said that he doesn’t play other classes at the strength of his Warrior decks. This is why I feel his chances are a little lesser than Fr0zen’s. Besides that, Fr0zen and Fibonacci have the strong lists of Control Warlock and Mind Blast Priest. Both have some unique techs so we’ll have to see how that works out. They’re ending their lineup with another wildcard in the Spell Hunter. With only four people bringing a lineup with Spell Hunter, its power level isn’t clear to everyone. Maybe people’s lack of practice against it can give them the edge they need to succeed!